With so many wireless iOS networking apps for the iPhone, iPad, and iPod touch available, there's very little reason to connect any of these devices to iTunes, except to update the software. Besides, importing and exporting photos using iTunes has never been one of the best features of Apple's mobile device process. Let me introduce you to 5 useful apps for importing and exporting photos to and from your iOS device(s). First off, if you're an iOS device user, you should definitely have a file sharing DropBox account and app. Dropbox is one of the best ways to sync files between computers and mobile devices, because all your files can be accessed, over Wi-Fi and 3g, via your online account. The latest version of DropBox now allows bulk upload of photos and videos to your account. With the Dropbox installed on your Mac, it's really easy to drop image content into a folder and then download it onto your iOS device, and vise versa. Another benefit of having Dropbox is that you can connect to your account from within many of the leading wireless file sharing apps, such as they ones I'm describing in this article. What I like best about PhotoSync is that it allows you to selectively choose photos and movie files that you want to sync between your iPhone and iPad, and any computers on your Wi-Fi network, or with a BlueTooth connection. You can even directly import photos from your iOS into your iPhoto and Aperture libraries. 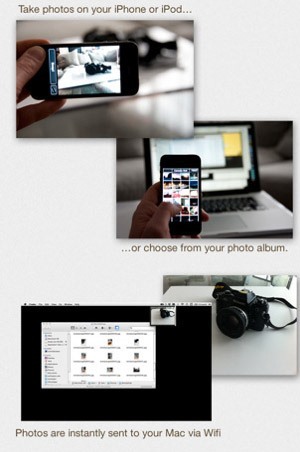 PhotoSync also includes a free Mac client for exporting images from your computer to your iOS device(s). 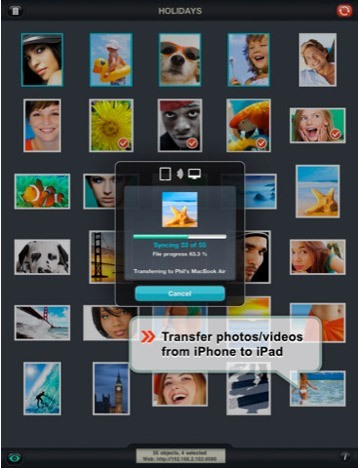 And like many photo syncing devices, you can use PhotoSync to transfer files to your Dropbox and Flickr account. RemoteSnap almost instantly transfers your images directly to your Mac or PC over Wi-Fi—as you snap them on your iPhone, or select existing images from your iPhone Camera or Photo Library. To use RemoteSnap, you will need to download app to your iOS device, and then install the free "RemoteSnap Server" client on your Mac or PC. The setup is very easy. With RemoteSnap's instant transfer feature, you could set up a Hazel automation to automatically open and display images as they are sent via RemoteSnap, which means others can view your images as you take them. If you would rather not waste time selecting photos in your iPhone Camera Roll to upload to Dropbox, download a free copy of Picbox, which automatically copies entire Camera Roll of photos and/or videos to your Dropbox account with one single tap. 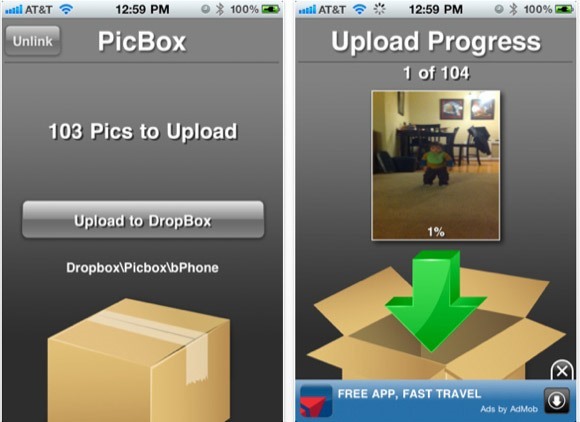 On top of that, Picbox keeps track of which images it has already uploaded to your account. It does not erase your original images on your Camera Roll, it simply copies them to your account. As you may have noticed, each of the apps I have described do basically the same thing, but in a slightly different way. But for a completely hassle-free uploading of pictures and video from your Camera Roll to your Dropbox, iDisk, FTP server, Amazon S3 bucket, Flickr or Box.net account—CameraSync will automatically begin the upload process right after you open the app. CameraSync can do all the uploading in the background, which means you can switch away from the app and do other things on your iPhone. CameraSync will also keep track of which images and videos it has already uploaded. Yes, CameraSync and PicBox are nearly the same, the only difference is how fast you want the upload process to begin. Well, the above are my picks for the top photo syncing apps. Let me know which ones you prefer. My iPhone won't sync videos - just photos - anyone know why? 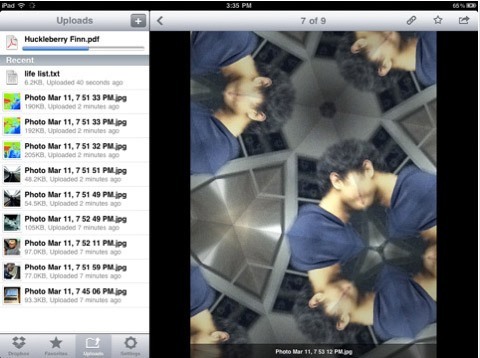 Looking to export iPhone/iPad photoALBUMS created on the device using native photo app iOS. Instafusion Image Blender is a great app for iPhone,iPod and iPad users that are looking for a new way to customize and share their pictures !! !